Over the last 55 years the James Bond franchise has seen six actors star officially as 007 across 24 movies. Now as the 25th has been announced for 2019 YouGov have polled 3592 UK residents to discover the nation’s favourite Bond actor. The 007 stars in order are Sean Connery, George Lazenby, Roger Moore, Timothy Dalton, Pierce Brosnan and Daniel Craig. And it turns out that Connery, the original Bond, is still the nation’s favourite with 27% of the vote. He was followed by Craig in second, Moore third, Brosnan fourth and Dalton in fifth place. Meanwhile poor old Lazenby, who starred in just one Bond movie, received no votes at all. 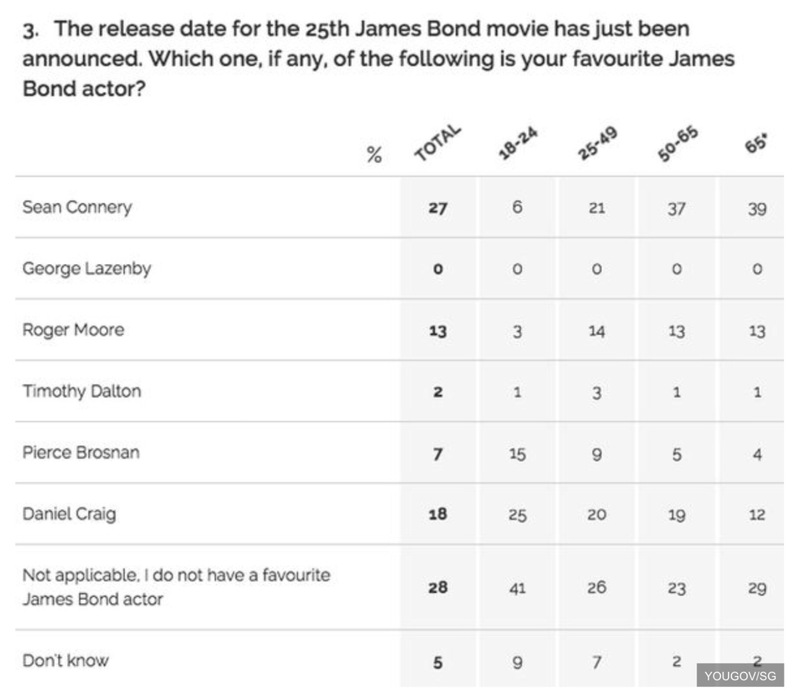 Nevertheless while Connery was voted the favourite, the answer with the highest percentage was “Not applicable, I do not have a favourite James Bond actor”, with 28% of the vote. Also 5% said they just didn’t know. The poll also took into account the age of each person who voted, with the highest percentage tending to be in the age bracket that grew up with that actor as their Bond. Nevertheless both Craig and Moore mainly broke that pattern, appealing across most of the age groups.